Following a Self Management Plan will also help you work out how well you are and what to do if your COPD gets worse. Giving up smoking is crucial to reduce the incidence and effects of COPD, making it the most important step you can take. Every cigarette you smoke adds more damage and makes your condition worse. It is never too late to stop, and there are lots of people and organizations that want to help you. Sometimes it is harder to do it alone, so gather as much help as necessary. For a Quit Pack, information and support call Quitline 0800-778-778. The Quitline also offer Nicotine replacement therapy. Your doctor, nurse, or pharmacist will also have information on stopping smoking. Delay acting on the urge to smoke. Don’t open a pack or light a cigarette. After 5 minutes, the urge to smoke weakens and your determination to quit will come back. Deep breathe. Take a long slow breath in, breathe slowly out again. Repeat three times. Drink water. Sip slowly, holding it in your mouth a little longer to savour the taste. Do something else. Take your mind off smoking by taking action – put on some music, go for a walk or ring a friend. Just one cigarette WILL hurt – that is the way most people go back to regular smoking. Don’t be afraid to ask others not to smoke near to you. Your family and friends will be keen to help you breathe clean air if you explain why. Thanks to the Quit Group (Cancer Society, Health Sponsorship Council, Te Hotu Manawa Maori) and the Health Funding Authority’s Quit Book, on which this information is based. Exercise helps your muscles, joints and circulation work as efficiently as possible. Although being somewhat short of breath with exercise is uncomfortable, it is not harmful. When you exercise your muscles regularly, they are able to do more work on less oxygen. Exercise should be enjoyable, so choose something that you enjoy. Walking suits many people with COPD. Swimming or riding an exercycle may be enjoyable ways to exercise both your upper and lower body. Begin at a comfortable pace which enables you to control your breathing, taking as many rests as you need. You can increase your distance or time slowly as your fitness improves. By making it part of your daily routine you will soon notice the benefits. Aim to gather 30 minutes of exercise each day. Your physiotherapist will be a good source for guidance on type and length of time. You may get breathless during activity, however with the right support and information, exercise can be an effective part of your management regime. Your doctor should assess you before you start on an exercise programme, and may advise you to take some reliever medication before exercise to help you to do more. Many local Asthma partners run exercise classes especially for people with long-term breathing difficulties. It is an excellent way of meeting people in a supportive environment. 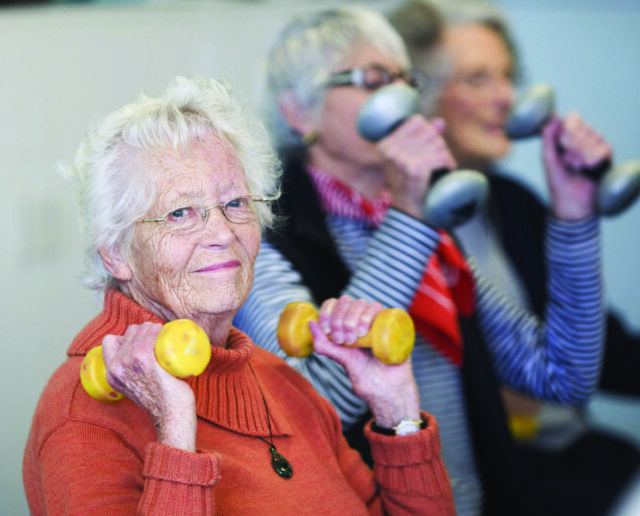 Your doctor or local asthma partner will also be able to advise you about local facilities, such as your hospital physiotherapy department, which may hold Pulmonary Rehabilitation - a useful programme of education and exercise, which is well worth attending for people with moderate to severe COPD. 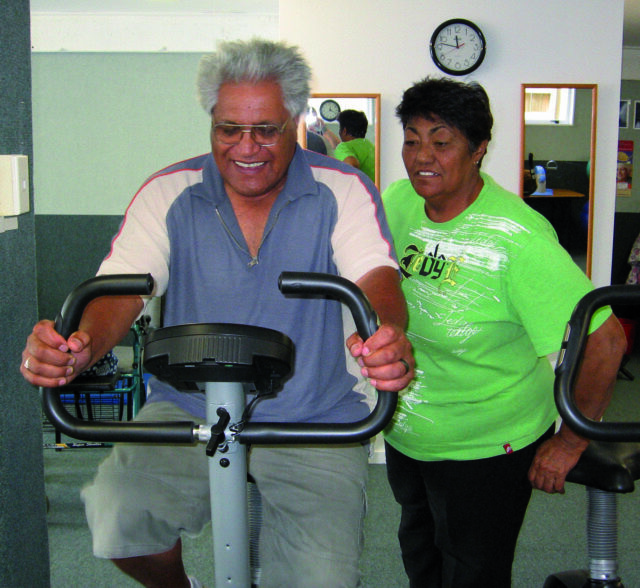 Pulmonary Rehabilitation is a programme of education and exercise which usually runs for 6 weeks. Everyone with COPD should attend at least one programme to ensure they understand all they need to know about COPD and how to manage it. The programmes are usually run by respiratory departments at the hospital although some areas have community programmes. Ask your doctor or your local Asthma partner what is available in your area. Although you may lose your appetite if you are breathless, it is important to eat well. With COPD more energy is required by the body for breathing, so you need to alter your diet to allow for this. If you are overweight you will benefit from weight loss to ease the load on your lungs and muscles. You will need to eat foods low in fat and sugar. For more information on what foods are best to eat, ask your doctor to refer you to a dietitian. There are lots of people who want to support you to look after your COPD well. It is important to build a partnership with your doctor, practice nurse, respiratory educator and pharmacist. Following their advice should help you reduce the number of symptoms you face. See our list of people who can help you here. An important preventive action for people with respiratory conditions is appropriate vaccination, including against influenza (flu) viruses and pneumococcus (which causes bacterial pneumonia). To improve access for people who need it most, the annual flu vaccine is free for people who have a diagnosis of COPD. It is important that you understand how your medicines work, and then take them as prescribed. Here are the medication used in COPD - not everyone who has COPD needs all of these medicines, and your doctor may try different ones to see what works best for you. Preventers are a steroid medication, which works on the swelling, mucus, and tight muscle in the breathing tubes. Preventers come in inhalers (puffer) or tablets. Only a few people with COPD are helped by preventers, so your doctor may give you a trial of the treatment for a few weeks to see if it helps you. If they prove to be useful they must be taken daily to have effect. Click here to see the different inhalers. Chest infections can be a problem when you have COPD. Antibiotic treatment may be necessary if phlegm changes colour from white to green or yellow. Your doctor may give you a supply of antibiotics that you keep at home, or your doctor will ask you to ring the practice. You must always take the complete course of antibiotics. Many people think oxygen is given to treat shortness of breath. This is not the case – being short of breath does not mean you are short of oxygen. Low oxygen levels over months or years can put a strain on the heart, leading to heart problems. Oxygen is given to prevent heart strain and must be used for a minimum of 15 hours per day. Your doctor will be happy to discuss this with you and arrange for a blood test to check your oxygen levels. Oxygen can only be prescribed with a Specialist’s approval. The oxygen is usually supplied through a machine called an oxygen concentrator. Oxygen is a drug and can have side effects. Don’t increase the dose unless you have discussed this with your doctor. People with COPD have to work harder to breathe and tend to breathe using the muscles in their upper chest, rather than the lower chest muscles. This takes more energy and is tiring. Breathing control exercises will help your breathing be more efficient and encourage you to use the correct muscles. A physiotherapist is the best person to help you with this. It takes practice to learn to breathe ‘low and slow’. This is also known as ‘tummy’ breathing or breathing control. Practice first when sitting and relaxed so that it is automatic when you really need it. Here are some things you can try to help reduce your breathlessness. Remember to get into a comfortable position when you try these techniques. Stand leaning back: lean back against a wall, with feet placed slightly apart and out from the wall. Relax your shoulders and let your arms hang loosely by your side. Some people with COPD produce a lot of phlegm (mucus) in their lungs and may find it hard to get it up. This makes breathing even more difficult. If you have a lot of phlegm you can learn ways to get it up (a physiotherapist can teach you this). To keep it as loose as possible drink plenty of fluids, and use your reliever inhaler to open the tubes before trying to clear phlegm. Changes in the colour of the phlegm may be a sign you have a chest infection and you should contact your doctor. A HUFF is a small breath IN and a fast breath OUT through an open mouth like you do to clean a spot off glass. Tighten your tummy muscles and chest as you huff. Huffing is more effective at clearing phlegm from the lungs than coughing. Having COPD is often stressful. It is not easy to accept that your breathing limits your daily life. Work out what triggers stress for you and note how it affects your body, thoughts and behaviour. It may be your environment (e.g. crowds or a smoky room), your physical state (e.g. discomfort from breathlessness or tiredness), or your psychological state (e.g. unrealistic beliefs about yourself, or feeling frightened). Thoughts: racing thoughts, difficulty concentrating or making decisions, anticipating or magnifying problems which may not exist, thinking more about ourselves and forgetting others’ needs. Emotions: feeling irritable/angry, feeling anxious or panicky, feeling overwhelmed, helpless or hopeless. Behaviours: sleep disturbance, decreased ability to say no to “quick but unhelpful fixes” such as alcohol, cigarettes, coffee, more aggression towards people and objects, an inability to complete goals. Try to pursue interests. You may need to swap jobs in the house which demand too much energy (e.g. cooking instead of gardening). Learn to accept responsibility for your own feelings. Even when things seem unfair with your health, it's up to you whether you'll be bitter and resentful, or retain control over your feelings and actions. Acknowledgement for assistance with this information to Claire Dawson, Senior Clinical Psychologist, Canterbury Respiratory Services.